I’m now the proud owner of a HQ Sixteen. In February we caught our taxes up and I was getting a nice refund. Since I figured I’d probably never get a large sum all at once again I decided to invest it into a long arm. So I started researching and called some shops to find pricing… Lucky me one of the ladies from one of the shop wanted to upgrade her machine to a deeper throat. So I was able to get her machine for a good price… This lady was the most awesome and patient as instead of getting my refund right away the lovely Revenue Canada decided to do a inquiry on myself to make sure that my children lived with me and that I lived in the home we bought over 13 years ago. So now we both had to wait for this machine to be purchased and sold. When the refund came in it trickled in over a period of 3 months and Finally last Monday all the funds were released so I was able to pick up this lovely on a 12 foot frame. 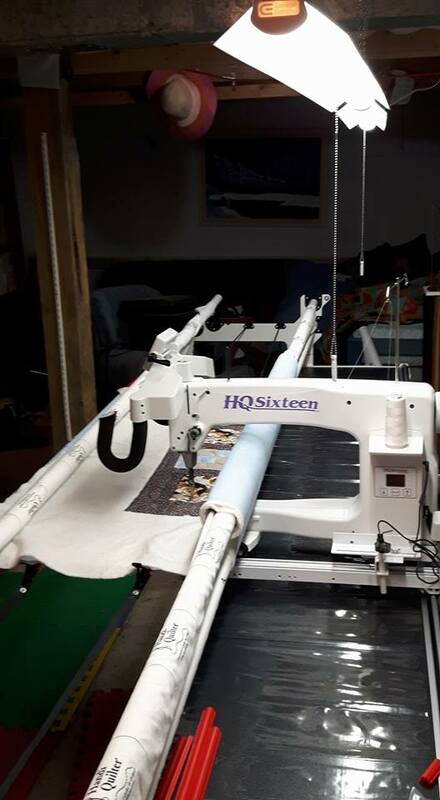 I was so lucky the machine came with Bobbins, upgrade on everything machine and frame, ruller table, Red snappers, channel locks and the plastic to put over the pantos. Not only that she took the machine in and had a new motor and all power modules and wires replaced. I also ran well drove to the quilt shop and pick up a few rullers, and some other things. Ruler of the month.. Click link to view This club I will receive 1 ruler for the next 6 months. 3×6 small straight edge ruler. This should get me started. Today I set up lights over my long arm using shop LED 4 foot light ballasts. I purchased 2 of these and hung them from hooks in the ceiling. This work real well as my basement does not have any windows. I spent the afternoon loading and quilting a charity top that I had made to practice on. I’m quite happy for my 1st try. I’ll keep you all updated as I progress with my long arm skills. Next Coming soon… Christmas Row along. Congratulations!!! I don’t think I’ll ever buy one, but I do plan to take a class on how to operate them, and then possibly rent the use of them.